Macbook Pro with Retina is a thoroughly professional machine that boasts of a rich and sharp display accompanied by excellent configuration thus making it the first choice for fulfilling personal and professional requirements. 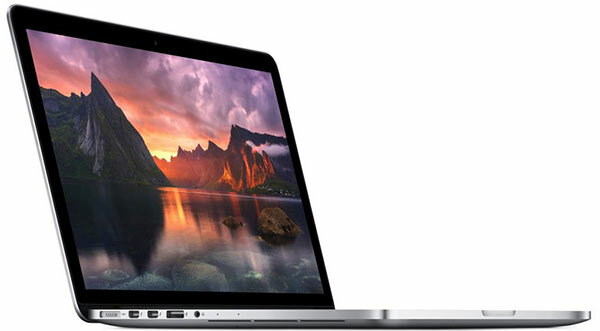 The Apple MacBook Pro (Model: ME293HN/A) has already been termed as a serious machine by tech-savvy individuals owing to its powerful make and endurance that have been packed together into a portable design. Apart from the feel and functionality of the ultrabook, it also packs a good overall punch in the form of providing consumers with a very long battery time, a great Retina display, and feather weight design. With over 4 to 5 million pixels (depending on the make) the MacBook Pro amazes with its spectacular display that gives a life like feel any image. 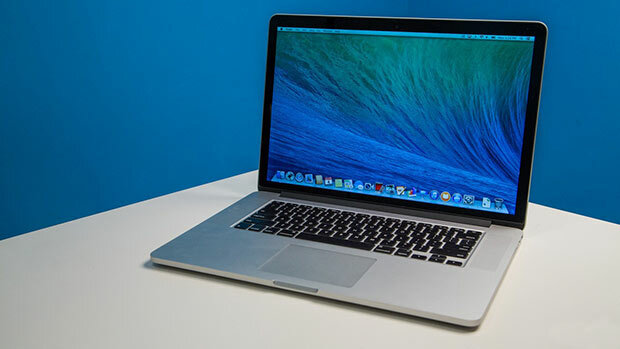 The MacBook Pro has a 2880-by-1800 resolution that shows images with great accuracy. Combine this with sharp text quality and the ability to view documents, web pages or reading email with ease, and using this machine would become a pleasurable activity for the user. To keep their head above the water in the ruthless technological race between corporations, tech businesses have to introduce mind-boggling innovations in their products to retain their followers. The MacBook Pro has been built around an all-flash architecture which means that this machine is not only durable, reliable, and energy efficient, but is also very fast. The notebook is powered by Intel Core i7-4750HQ processor running at a speed of 2 GHz. The processor is complemented by a DDR3 RAM of 8GB that ensures the smooth running of the machine. The elite model in this series has a standard 16GB of lighting fast 1600MHz of memory. The MacBook has an amazing display that is coupled with powerful graphics. The fourth-generation Intel Core i7 processor features Iris Pro Graphics with 128MB of embedded memory, which speeds up the processor and graphic-intensive tasks by acting as a super fast cache. For an even exhilarating experience, you can choose a 15-inch model that combines the power of Iris Pro Graphics with the new NVIDIA GeForce GT 750M. The video memory has also been enhanced twofold from the previous generation NVIDIA graphics processor by introducing 2GB of GDDR5 memory. The all-new MacBook Pro is a high performance product all the way, including its I/O ports. 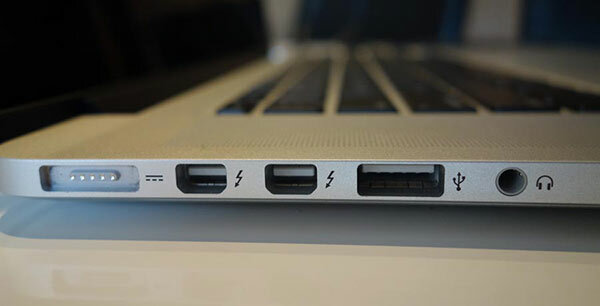 At present, thunderbolt is the fastest I/O available in the market and this model comes with two thunderbolt ports. This upgrade enables you to connect to other high performance devices, including external displays, RAID arrays, Gigabit Ethernet networks, video capturing devices, and FireWire peripherals. The FaceTime HD camera is built into the widescreen Retina display that allows you to make 720p HD calls to anyboyd’s iPhone, iPad or Mac. The latest MacBook Pro allows the user to build a complete professional studio with the help of two USB 3 ports, an HDMI port, and an SDXC card slot. In OS X, multi-touch technology defines the way you interact with your Mac. In fact, the OS X is what truly defines a Mac. The new MacBook Pro has a multi-touch trackpad with a large, all-glass button surface so that you could tap, swipe and click away with utmost comfort. It also allows you to easily switch between apps, check your content, and utilize your desktop space efficiently. 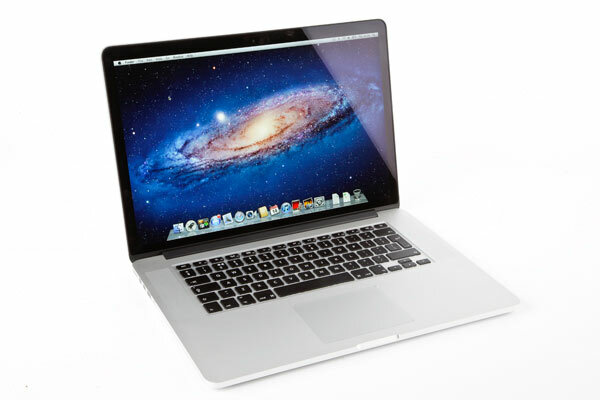 The MacBook Pro has up to 9 hours battery time for the 13-inch model and around 8 hours for the 15-inch model. If one looks at the high-resolution display, state-of-the-art processors and graphics, then the 8 to 9 hours battery time is a brilliant achievement by modern computer standards. In addition, the built-in Li-Po battery gives up to 1,000 full charge and discharge cycles, while lasting up to 30 days of instant-on standby time. The MacBook Pro ME293HN/A Ultrabook is a heavy duty device that has been created to support powerful computing requirements effortlessly. On the other hand, consumers have also given their feedback regarding the weaknesses of this machine. The feedback from consumers ranges between the fan getting noisy, display going blind under the glare of natural light, and the back of the machine getting warmed up way too soon. Nevertheless, the Macbook is a thoroughly professional machine that boasts of a rich and sharp display accompanied by excellent configuration thus making it the first choice for fulfilling personal and professional requirements. The SSD storage may not be sizeable but responds quickly when required. We also can’t ignore the long battery time of the device that gives it a clear advantage over other machines of its generation. All in all, Apple MacBook Pro ME293HN/A is a good long time investment that won’t disappoint you.